Welcome to the alternative world of Frank Zappa, the one and only. This is, as far as we know, the first attempt in many years to publish a complete guide to alternative Frank Zappa records. Even though we have put an enormous effort into making this as correct as humanly possible we can just state right away that this contains several errors. All of us who collect records in any way know that hard facts are very hard to obtain. To get facts about alternative records is just about impossible. The very nature of making and distributing these records make such an attitude very understandable. We have not or will ever be' part of making or distributing alternative records. Neither do we know any who does so or where to get hold of any of these records. 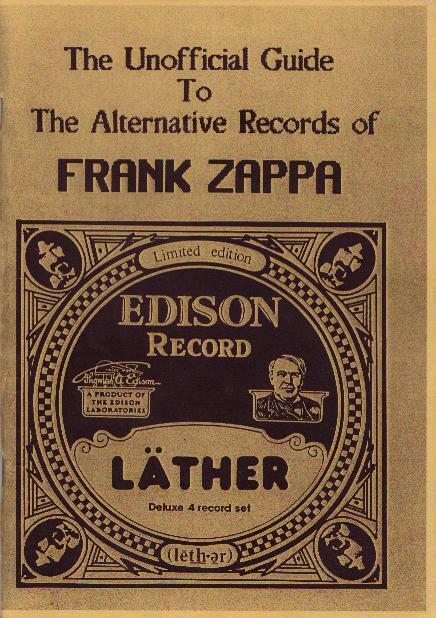 We are merely into this as fans of Frank Zappa and collectors of his music in all forms available. The "we" above needs an explanation. We are Frank Zappa Society Norway and we have existed since 1980. 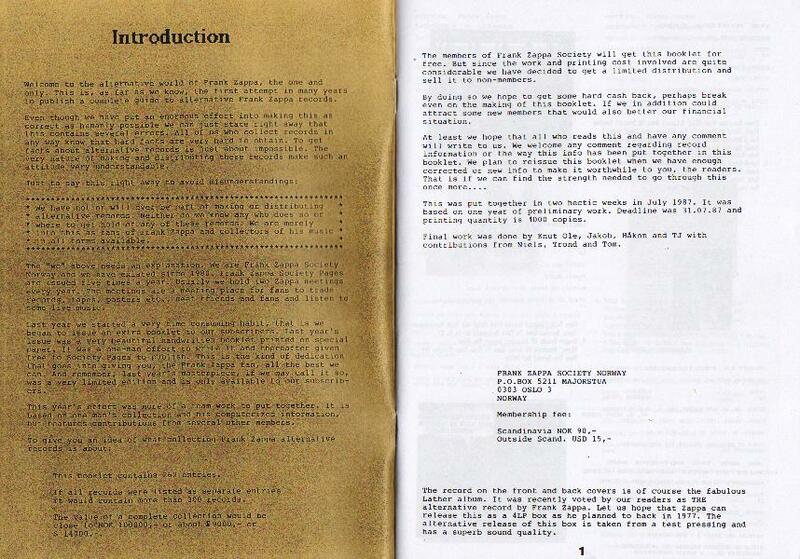 Frank Zappa Society Pages are issued five times a year. Usually we hold two Zappa meetings every year. The meetings are a meeting place for fans to trade records, tapes, posters etc., meet friends and fans nil ten to some live music. Last year we started a very time consuming habit, that is we began to issue an extra booklet to our subscribers. Last year's issue was a very beautiful handwritten booklet printed on special paper. It was a one-man effort to write it and thereafter given free to Society Pages to publish. This is the kind of dedication that goes into giving you, the Frank Zappa fan, all the best we can. And remember, last year's masterpiece, if we may call it so, was a very limited edition and is only available to our subscribers. This year's effort was more of a team work to put together. It is based on one man's collection and his computerized information, but features contributions from several other members. This booklet contains 262 entries. If all records were listed as separate entries it would contain more than 300 records. The value of a complete collection would be close to NOK 100000,- or about GBP 9000,- or USD 14000,-. The members of Frank Zappa Society will get this booklet for free. But since the work and printing cost involved are quite considerable we have decided to get a limited distribution and sell it to non-members. By doing so we hope to get some hard cash back, perhaps break even on the making of this booklet. If we in addition could attract some new members that would also better our financial situation. This was put together in two hectic weeks in July 1987. It was based on one year of preliminary work. Deadline was 31.07.87 and printing quantity is 1000 copies. Final work was done by Knut Ole, Jakob, Håkon and TJ with contributions from Niels, Trond and Tom. The record on the front and back covers is of course the fabulous Läther album. It was recently voted by our readers as THE alternative record by Frank Zappa. 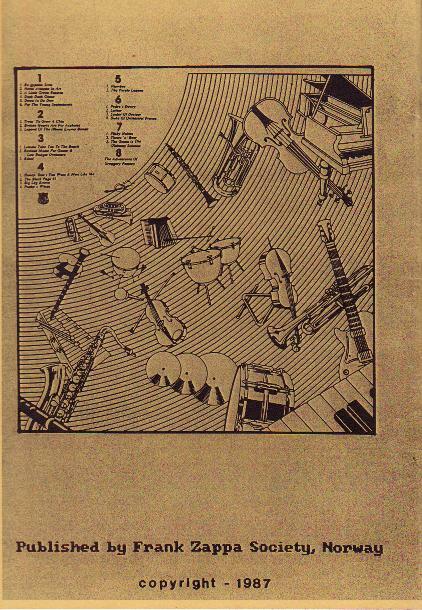 Let us hope that Zappa can release this as a 4LP box as he planned to back in 1977. The alternative release of this box is taken from a test pressing and has a superb sound quality.